I was an eyewitness to the carnage. I lived on Bonanza St, just two blocks from Pacoima Junior High School. I was only seven at the time and I went to Terra Bella Elementary next door. The two schools shared a common chain link fence about 10 feet high. On that particular day, I was home with a cold. The whole house shook from a sudden and violent explosion. 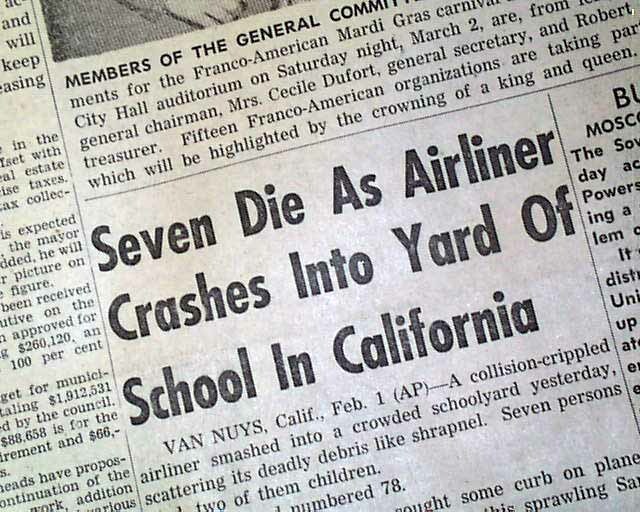 My mother had heard the whine of the falling plane and ran out screaming, “Oh, my god, oh my god, I think a plane just crashed!” We looked out the front window and saw a mushroom cloud of thick black smoke rising over the schools. Nuts and bolts and debris began to rain down on the roof, but nothing that was large enough to cause any damage. For some god-forsaken reason, my mother scooped me and a my baby brother up and we headed for the sight of the explosion. Hundreds of mothers in the neighborhood were also running toward the school, all of them screaming as we all descended on the horrible sight. We entered the playground through the faculty parking lot and beheld a twisted, scorched and oil-soaked landscape. 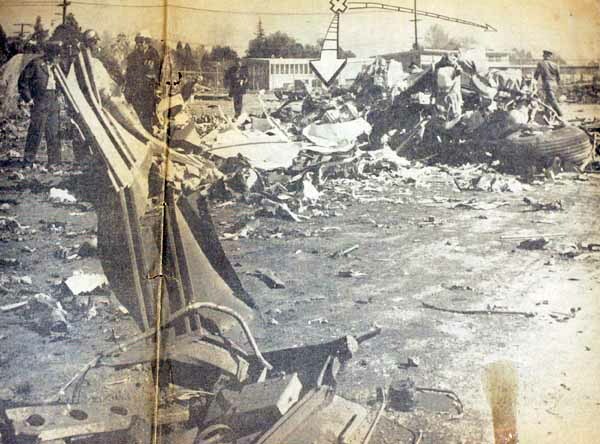 Wreckage was still on fire, strewn everywhere, having slammed into fences, backstops, basketball hoops, and, of course, children, who lay everywhere, burned and bleeding from gashes too grisly to comprehend. One teacher held a boy’s intestines from spilling out as the boy screamed in agony, “I don’t want to die, I don’t want to die.” Teachers were everywhere, trying to comfort the injured. Off to one side, a large plane engine lay embedded 15 ft. down in the earth, smoldering with an acrid fume. Over by a demolished backstop, a burned and mangled crewmember was still strapped to a chair, his death stare looking out at the carnage that was all around. There was a huge part of the plane lying in the small church parking lot that bordered the east side. To the west, several of the elementary bungalows that skirted the playing field, mine included, were pocked with gaping holes where debris had torn through the fence and into the rooms. A boy, his hair covered in hot oil, walked blindly along the fence. By fortune, all of those classrooms’ students were assembled on the other side of the school; had the children been there, the death toll would have been much higher. The police and ambulances finally arrived in droves, driving on sidewalks and front lawns to reach the school because the roads were clogged with frantic parents. I still remember one woman, horrified nearly senseless, walking through the wreckage screaming “My baby, my baby, where is my baby?” The police took charge and emptied the playground of mothers and gawkers. A perimeter was established and we all stood outside the barriers for several hours, watching ambulances and police and news trucks come and go. Women and men wept openly and copiously.